A Shi'ite magazine publication called "Risaalah al-Taqreeb" (which has its own dedicated website) is aimed at "bringing together the various madhahib." It is part of the Shi'ah agenda to make inroads into the people of the Sunnah under the guise of co-operation and unity. In its 79th edition (published in 1431H), they reproduced an open letter writtten by Sayyid Qutb to Ayatollah Kashani on 24th Dhul Hijjah 1370 (25/12/1951). Their purpose in reproducing this historical letter is in keeping with the broad objective of the magazine of making "taqreeb" (nearness) between the Shi'ah and the Sunnah. Here we will reproduce the introduction given by the magazine editors. The letter itself simply speaks about a general "Islamic Awakening" across the globe and Qutb alludes to various figureheads and groups, from them Ayatollah Kashani of Iran, Ahmad Yaaseen of the Socialist Party. Here is a scan of the original publication (ar-Risaalah) in which the letter was published in 1951. The title is "When the support and victory (granted by) Allaah comes" and a subtitle is "Dedicated to Ayatollah Kashani." Sixty years ago, the Ustaadh, Shaheed[*] Sayyid Qutb sent a message to Ayatollah al-Sayyid Abu al-Qasim al-Kashani, the leader of the Harakah Ta'meem al-Naft (Movement to Nationalize Petroleum) and to expel the occupiers and their companies from Islamic Iran, and it was published by the Egyptian weekly magazine "al-Risalah" in edition no. 951 released on 24th Dhul Hijjah 1370 (25/12/1951). And the letter of al-Shaheed[*] Sayyid Qutb is an important historical documentary (piece of) evidence that is an expression of the positive, excellent step whose aim was to strengthen the bonds of brotherhood, love and affection between the Muslims and throw aside separation and differing and to cement the bonds of nearness between the various schools (of thought) and of Islamic unity. Just as it also reveals the depth of strong ties and connections between the sincere scholars and thinkers (who are) eager for the future of the Islamic Ummah, and (for) aiding the issues (affecting it) with a spirit filled with brotherhood and love, far removed from any detestable factionalist orientations. And here we will reproduce the distribution of the letter in this edition of "Risaalah al-Taqreeb" in order to perpetuate the remembrance of two notable mujaahideen, al-Shaheed[*] Sayyid Qutb and Ayatollah Kashani, the two leaders of the movement for unity, brotherhood and Jihaad. [*] Declaring a person as "shaheed" in such a way, is incorrect and impermissible, it can only be applied to the one whom the Messenger (sallallaahu alayhi wasallam) testified for or whom the whole ummah has united upon, that he is a shaheed (fatwa of Shaykh Ibn Uthaymeen). Umar al-Tilmisani, the third supreme leader of al-Ikhwan al-Muslimeen wrote in his book "Dhikriyaat, Laa Mudhakkaaraat" (p. 131), (كان طلبة الإخوان يحتفلون بذكرى نواب صفوي رئيس جمعية فدائيان إسلام الشيعية في إيران), "The students of al-Ikhwaan used to celebrate the mention of Nawab Safawi, the leader of the Jam'iyyah Fedaa'iyaan Islaam al-Shi'iyyah in Iraan." He also said in the same book, (ولم تفتر علاقة الإخوان بزعماء الشيعة فاتصلوا بآية الله الكاشاني واستضافوا في مصر نواب صفوي ، كل هذا فعله الإخوان لا ليحملوا الشيعة على ترك مذهبهم ! ، و لكنهم فعلوه لغرض نبيل يدعو إليه إسلامهم وهو محاولة التقريب بين المذاهب الإسلامية إلى أقرب حد ممكن), "And the connection between the Ikhwaan and the leaders of the Shi'ah did not slacken. They connected with Ayatallaah Kashani, and they invited Nawab Safawi to Egypt (hosting him as a guest). All of this was done by Ikhwaan not in order to make the Shi'ah leave their madhhab but they did this with a noble objective which their Islam called them to, which is to try and bring closeness between the Islamic madhhabs to the closest level possible." What al-Tilmisani is alluding here is Sayyid Qutb reaching out to both Nawab Safawi and Ayatollah Kashani. In 1953 the Muslim Brotherhood invited Nawab Safawi to Egypt, and we have pictures of this Rafidee with Sayyid Qutb on that occasion. That there should exist this type of cordiality, love, friendship, affection (as described by the editor of "Risaalah al-Taqreeb") between Sayyid Qutb and the Raafidah is not very surprising because Sayyid Qutb made Takfir of Mu'awiyah, his parents (Abu Sufyan and Hind) and the Companions from Banu Umayyah. He also belittled Uthman (radiallaahu anhu) - and all of this was due to a Marxist, Socialist reading of Islamic history. Qutb was poisoned by Western (European) materialist philosophies before turning to Islam and that poison came through in his books (Social Justice in Islam, Battle Between Islam and Capitalism). Another Rafidee, Ayatollah Khamenei was very impressed by Sayyid Qutb and his writings and he initiated a translation of one of his works, and in the 1970s Qutbs revolutionary ideas were instrumental, along with those of Ali Shariati, in aiding the Iranian Revolution. Sayyid Qutb himself was influenced by the writings of Abu A'la Mawdudi who also had that Rafidee poison towards Mu'awiyah and the Banu Umayyah and Abu A'laa Mawdudi was a very close friend of Ayatollah Khomeini as indicated by his own son who wrote a book on the subject of the close relationship between the two. Mawdudi praised the Iranian Revolution as a true Islamic revolution. 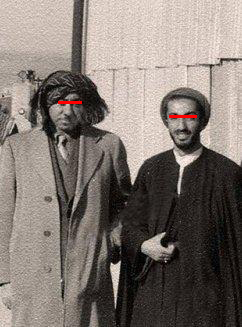 Further, Khomeini was also a good friend of Nawab Safawi (who was executed in 1956 for an assassination attempt on Hussain Alaa, a minister in the government) and they had history together. When you stand back a little and just take a look at all these names, Ayatollah Kashani, Ayatollah Khomeini, Nawab Safawi, Ayatollah Khamenei, Sayyid Qutb and Abu A'laa Mawdudi you are seeing the synthesis of Rafd and Kharijiyyah. Namely, the original hatred, resentment, Takfir, and revolution against the Companions of Allaah's Messenger initiated by the activities of one Abdullah bin Saba' al-Yahudi who raised the flag of "Social Justice" and roused up the vagabonds and criminals leading to the assassination of Uthmaan (radiallaahu anhu) and subsequently leading to all the tribulations. Be not surprised then that Khomeini, Khamenei, Nawab Safawi, Kashani and Sayyid Qutb all held the belief that Mu'awiyah and the Banu Umayyah were kafirs and all of them have that revolutionary, kharijee methodology and we see the same slogans coming from them all, "Imaamah" (leadership) "Haakimiyyah", "jaahiliyyah" (Mawdudi, Qutb and Nawaba Safawi all outlined this doctrine), "al-Adaalah al-Ijtimaa'iyyah" (Social Justice). It would be wise for you to remember that historically, Rafd has ties to Khaarijiyyah since both these innovations were borne out of the activities of the Sab'iyyah, Abdullah bin Saba' and his followers. Qutb actually praised the revolution of Abdullah bin Saba' against Uthmaan (radiallahu anhu), stating that it was an outburst of the true Islamic spirit, even though he acknowledged it was a plot by Abdullah bin Saba' (see here, here). So the hearts of these people are all the same. You see the same ideological poison running through their veins, hearts and minds, and you see them all cordial with each other, whilst attacking the choicest of Companions, indeed the writer of revelation, Mu'awiyah (radiallaahu anhu). We highlighted the corruption and extremist Irjaa' coming from certain quarters and in particular two hate-filled, resentful Takfiris by the names of Abu Zubair Saleem Begg and Abu Fatimah Salman Awan. Their corruption and hypocrisy (in outward speech and deed) is plain and clear for all to see walhamdulillah, and they had no response, since it exposed them for their khubth (vileness) that resides in their hearts which is that their love for Sayyid Qutb and his honour and reverence is geater in their hearts than for Mu'awiyah (radiallaahu anhu), his parents and the Banu Umayyah. This is proven to be the case through their own actions and we demonstrated this clearly and lucidly in the above article, so refer to it to see that filth made as clear as the daylight sun. Here we have another issue that further helps to explain the ideological conviction of Sayyid Qutb, when we see his cordiality towards the enemies of Allaah, the enemies of the Messenger of Allaah (sallallaahu alayhi wasallam) and the enemies of Mu'awiyah (radiallaahu anhu). It should be noted that despite being refuted and advised by Mahmood Shakir in 1952, Qutb, resentfully persisted in his Rafidi ideological poison and he continued to publish it in his books, right until the 1964 edition of "al-Adaalah al-Ijtimaa'iyyah" indicating that he did not repent, but stubbornly persisted upon his views. O Allaah, we ask you to raise us on Yawm al-Qiyaamah with Mu'awiyah bin Abu Sufyan, Amr bin al-Aas (radiyallaahu anhum), Shaykh Mahmud Shakir and others who defended the honour of Mu'awiyah, his parents and the Companions of Banee Umayyah and we ask you O Allaah to raise Abu Zubair Saleem Begg and Abu Fatimah Salman Awan with Sayyid Qutb and Mawdudi and that you raise Sayyid Qutb and Mawdudi with Khomeini, Khameini, Kashani and Safawi for indeed the love of these Ghulaat al-Murji'ah is greater for Sayyid Qutb than it is for the honour of Mu'awiyah, his parents and the Companions of Banu Umayyah whom Qutb made Takfir of and for which there is no evidence of any tawbah that meets the conditions of an acceptable tawbah - [rather Qutb continued upon this ideological conviction, unrepentantly, right through to the 1964 edition of al-Adaalah al-Ijtimaa'iyyah which retained that Rafidee poison against Uthmaan, Mu'awiyah and the Bani Umayyah (radiallaahu anhum)]. It is for Qutb's sake that these Ghulaat al-Murji'ah wage the fiercest of wars against the people of the Sunnah - a matter that is mutawaatir from them. And hence, they manifest their extremist, extremist Irjaa' in that whereas the tasdeeq in their hearts of the excellence and virtue of Mu'awiyah and Amr bin al-Aas should have filled their hearts with disgust at Qutb's ideological position against them, they instead turned the disgust of their hearts to those who defended these noble Companions from the Rafidee poison of Sayyid Qutb - and thus their eemaan in this regard is the eemaan of the Jahmiyyah - and refuge is from Allaah - namely, the attainment of al-eemaan al-waajib (the obligatory eemaan) [in this case with respect to the Companions] through mere tasdeeq alone, absent the actions of the heart which must by necessity follow! And it is from the Divine justice that whereas they accused the Imaams and Scholars of Ahl al-Sunnah with Irjaa', it is they who physically and practically manifest the most extreme of Irjaa', the Irjaa' of Jahm bin Safwaan, and their actions prove and establish this in a matter than cannot be disputed except by the most lying and dishonest of people, since these actions of theirs are known to all people and are mutawaatir from them.